We’re so pleased to have a guest post here from a musician who had truly traveled the world to share music. Take a moment to meet Jay Sand and learn about the “We Are Happy” song he uses to open his wonderful concerts that shares world traditions with the children. I’m Jay Sand, a music teacher from Philadelphia and founder of All Around This World (http://www.allaroundthisworld.com), a global music and world cultures program for little kids. 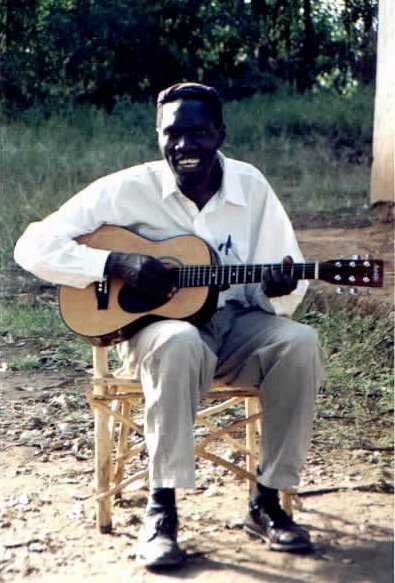 In 1999, long before I discovered my passion for multicultural music, my backpack, my camera, my guitar and I ventured to Africa where I visited, photographed and sang songs with members of several communities of Africans who practice Judaism–from Tunisia to Ethiopia, Ghana to Zimbabwe. My goal at the time was to document the multicultural reality of the Jewish people and share images, music and stories from my travels with an American Jewish community that seemed reluctant to accept Jews that were not Western and, especially, not white. The African Jews who welcomed me most fully on my first voyage were the Abayudya of Uganda, a group of about 1,000 Bagandans who live scattered among several villages near the eastern Ugandan city of Mbale. “Abayudaya” means “the people of Judah.” In 1919 a prominent Ugandan leader, Semei Kakungulu, completed his process of religious exploration by committing to following Jewish laws and practices as described in the Old Testament and declaring himself and his several hundred followers to be Jews. For the next 75 years the Abayudaya had very little contact with others who practices Judaism, save for some meetings with visiting European-descended Jews who informally shared information about observances and holidays. The community didn’t wait for Jewish travelers to tell them how to practice. They built their own customs based on Jewish books visitors brought them and wrote their own Jewish music using lyrics from Bibles Christian missionaries had translated into local languages. In the mid 1990s community members decided to reach out, sending their young “Rabbi,” Gershom Sizoumu to Nairobi, Kenya to connect with the wider world. In Nairobi Gershom connected with a friend of mine who sent me a cassette of the Abayudaya’s unique African-Jewish music. It was melodic, joyful and so inviting that I began to formulate a scheme to visit Uganda that I finally realized in 1999. The highlight of my time with the Abayudaya was getting to sing with Gershom and other members of the community. Over the next several years I traveled around the United States making multimedia presentations about African Jews at museums, universities and for community groups. The audiences responded most enthusiastically, and were most accepting of the non-traditional Jews I had visited, when I taught them African-Jewish music. “We Are Happy” is one of two songs the Abayudaya sing to greet important visitors. Rabbi Gershom and his brother JJ Keki wrote the two songs and led the community in singing them for me during my first visit. When I founded All Around This World in 2009 and realized every children’s music class must — must! — have a hello song, I couldn’t have been more pleased when Gershom and JJ gave me permission to blend their two songs into one and sing that song with my students. Since then I have sung my version of “We Are Happy” at the beginning of every class, each time changing the language of our greeting to match that week’s featured country. In my classes I’ve taken “We Are Happy” to well over a hundred countries and taught it to thousands of children and their grownups. Every time my students sing “We Are Happy,” while my tiny, enthusiastic students are thinking about how much fun they’re going to have learning about the world music class, I think of Gershom, JJ, and their tiny, enthusiastic community that appreciates the mind-opening power of a song. Ooh, bop bop bop! Ooh, bop bop bop. We are happy, we are happy on this day. This entry was posted in Africa and tagged AATW Music, diversity, Gershom Sizoumu, Jay Sand, Jewish music, Jewish music from Africa, Jewish music from Uganda, JJ Keki, music around the world for kids, music from Uganda, music from Uganda for kids, Uganda song, We Are Happy, We Are Happy Song by dariasblogs. Bookmark the permalink.